We’ve already taken a detailed look at how outsourcing of social media could increase in 2012, but how else is the industry set to change in the coming year? There’s a lot to be expected in 2012, from Facebook’s impending and much-anticipated IPO, to seeing how the Google+ and Facebook rivalry will finally play out. With the three heavy hitters – Facebook, Twitter and Google+ – taking up most of the social media space, it’s hard to imagine a new company coming into the picture and taking people’s attention away from existing services. Instead, we’ll probably continue to see services that plug into the existing environment, like Flipboard and its many competitors, which have capitalized on how social media has become a tool for the curation of current events and news. While the news aggregator space is overcrowded as it is, other tools may come to the forefront in 2012, capitalizing on social media as a tool to be used in politics, particularly with the US presidential elections on their way, and in education. At the same time, new networks, like Path, have seen impressive growth rates, and with its focus on the mobile experience, 2012 may have a lot of good things in store for the unexpected service, but will it last? We take a look at these questions and more in the following list of 5 predictions for what 2012 holds for social media. When Google+ first launched, we all got our fill of the huge variety of GIFs which showed the new social network running over, slapping or beating the crap out of Facebook in a boxing ring. All joking aside, 2012 should be the year we finally discover who is going to win that match. 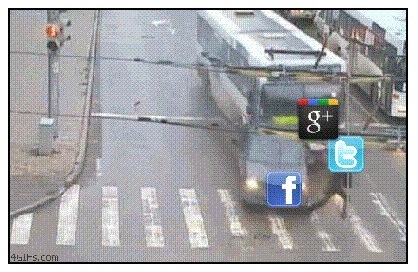 The competition between Facebook and Google+ is just getting started, and only one social network can come out on top. While there is certainly room for both in the social networking world, it remains to be seen if Google+ will be able to catch up with, and surpass, Facebook. 2011 was already a pretty heated year for both social networks. If anything, Google+ has forced Facebook right onto its toes, and the leading social network has been hard at work churning out new features, such as Friends Lists, not all of which have gone down completely well with its users, like the Timeline. So what about the coming year? The competition between Facebook and Google+ is bound to become more fierce, but there’s the potential for that competition to shift away from the end-user and head straight for the advertisers. After all, these are money-making ventures that provide their services for free. That’s not to say that the end-user won’t benefit. In fact, the end-user has everything to gain from the heated competition to bring advertisers into the fold. Advertisers want nothing to do with a site with dwindling popularity, so Facebook and Google are bound to keep throwing new features at us, upping the stakes, in an attempt to keep their current users engaged, and attract even more. Google+ has its work cut out for it, but with the company releasing very little information on the social network’s growth, something it certainly isn’t obliged to do, it leaves us with quite the guessing game as to what the coming year will bring. This is a fight for survival for Facebook — and for relevancy for Google. What happens in 2012 will make the difference between whether there is a Facebook by the end of the decade and whether Google can become truly relevant outside of search. If Enderle’s predictions are true, 2012 is a year that could very well decide the fate of these two social networking giants, and even if we don’t see any concrete results in the next 12 months, the year will certainly set them on the inevitable path of success or failure. Which path each company will be on is anyone’s guess. Path’s second attempt at finding its audience, repositioning itself as mobile-only social network available for both Android and iOS, is a great indicator of one of the main points of focus in the world of social media in 2012. In the space of 2 weeks, Path’s userbase grew by at least 800%, based on calculations of users who had signed up using their Facebook accounts. In the past two weeks, the growth has slowed slightly, having added another 200,000 users via Facebook, for a total of 500,000. As a mobile-only social network, available so far on only two platforms, iOS and Android, the figures are telling. People are more than happy to keep their social media experience based around their smartphones. With the ability to take and share photos, check-in to locations and share status updates all from the convenience of a handset, a lot of the focus will shift to improving both the smartphone and tablet experience that the major social networks offer. Not only will Facebook, Google+ and Twitter be constantly finding new ways to improve and enhance the mobile experience each social network offers, we are bound to see a slew of new mobile social networks that address niche needs. Path is not the only mobile social media app which has demonstrated impressive growth recently. iPhone app Oink, which we reviewed here, gained 150,000 users in the space of just over a month. While globally smartphones account only for 27% of the mobile market, penetration rates in Europe and the US are far higher, at 51% and 63% respectively. Elsewhere in the world, the figures are on the rise, with predictions of Android’s penetration tripling in Asia. With this kind of growth, the mobile market is an expanding world of potential for social media, and at this point, it’s anyone’s game. Social media has made significant strides in the world of journalism, and in the world of citizen journalism in 2011. This year we’ve seen Twitter break major news events, as was the case, for example, with Osama bin Laden’s death. We’ve also seen how social media has been used as a tool by activists on the ground, from the streets of New York to Damascus, broadcasting the story long before it reaches mainstream media. In 2012, social media will simply become a natural extension of the journalistic field. We’ve already heard a little bit about the plans mobile livestreaming app Bambuser has for 2012, to work closely with mainstream media outlets as a means of validating news stories without the need for a correspondent on the ground in the midst of the events. The predictions for Bambuser can be seen as a prediction for social media and mainstream media as a whole. As Alfred Hermida puts it, “2012 will be the year social media gets boring,” at least as far as the field of journalism is concerned. We’ve marveled this year at the use of social media in journalism, and in 2012, we will simply focus on using it as a tool, rather than talking about using it as a tool. However with the field of journalism embracing social media so completely, there are bound to be negative repercussions on the industry in 2012. We’ve already gotten a taste of the negative effect social media has had, particularly in the form of job cuts, as demonstrated by CNN’s most recent cutbacks. 2012 could very well hold more cutbacks due to the complete and utter mainstream use of social media as a reporting tool. The normalization of social media will extend much further than journalism. Some of these services have fast become household names, becoming standard tools of the marketing trade no matter what industry you’re in. With this mainstreaming of social media, we’ll probably see the slow and quiet death of add-on tools like Klout, which depend entirely on the novelty of social media. Once that novelty wears off, people are much less likely to feel the need to measure and grade themselves on tools which are simply an everyday part of our lives. There is probably no other IPO that has been more anticipated in the social media world, or possibly even the tech world, than the Facebook IPO. Predictions have already been made for months about Facebook’s $100 billion IPO, and we’ve already taken a look at how that figure fits in existing tech company valuations. But what does that mean for 2012? For starters, when the social media giant goes public, we can expect a slew of new angel investors in our midst. Facebook isn’t the only social media company with its IPO slated for 2012. Yelp has filed for an IPO of $100 million, trailing a distant second to Facebook’s predicted IPO, but the two companies are leading the biggest IPOs for Internet companies since 1999. All eyes will of course be on Facebook, and while the exact figure is yet to be known, either way, going public is bound to mean good things for the social networking giant, and may be a much-needed advantage it will have over Google, giving it instant access to the influence needed to cement its reputation as the number one social network available today. Twitter has already been slowly pushing small adverts into our timelines with sponsored tweets, and advertising on the social media site is bound to become more obvious in 2012. In August, we took a look at what exactly Twitter needs to do to get businesses and brands on its side, and with the launch of Google+ pages, the outlook for the microblogging site wasn’t entirely positive. 2012 has to be the year that Twitter figures out once and for all how to interact with advertising and with brands. And if it wants to be taken seriously, in the face of some pretty fierce competition with Facebook and Google, Twitter is going to have to step it up. While brands have been able to use Twitter as a customer service and marketing tool, up until recently, brands have not been given any extra tools, setting their accounts apart from the everyday user. While third-party services like Twylah, reviewed here, have given brands a way to harness just a tiny bit of that Twitter power in their online presence, 2012 will be the year we see Twitter offer a unique experience to its loyal brands. Twitter has barely scratched the surface with the launch of brand pages, which we took a look at here. Twitter’s offerings are pretty meek in comparison to the robust features afforded to marketeers already using Facebook, or delving into the newer world of Google+. Twitter has to up its marketing game in 2012, and it’s safe to assume that is exactly what it intends to do. The trick will be to find the right balance between advertising and marketing needed for a profitable business, while also retaining the features and atmosphere that has made it the incredibly popular tool that it is today. There are a lot of other predictions we have for social media in 2012, including an Android version of the Instagram app, an increased influence on search results, thanks in part to Google’s +1s, and an increase in multimedia in social networking. With smartphones on the rise, sharing photos, video and audio from your smartphone straight into the world of social media is fast becoming the norm. Do you have any predictions for social media in 2012? Let us know in the comments. Read next: Android has its own Japanese manga comic: "Sweet Android High-school"